Brooke Dojny’s The New England Cookbook (Harvard Common Press, 1999) is one of those reference works (like the more famous Joy of Cooking ) that I consult fairly frequently when I’m thinking about something I want to cook, but rarely actually choose to make anything from. That’s not because the recipes are bad, but more because of the very traditional, reference nature of this cookbook — the recipes are “exactly what it says on the tin”, the traditional recipes that those of us who grew up in New England remember from our childhood. There are illustrations, but no photos, and there is good historical material about the origins of each recipe, but rarely anything to get excited about. Her brownie recipe — or rather, her daughter’s brownie recipe (“Maury’s Best Brownies”, p. 561) is about as traditional as you can get, and I almost wrote it off completely, but then I noticed one unusual ingredient. “Maury’s Best Brownies” are traditional in nearly every respect, including the fairly small quantity (2 oz) of unsweetened chocolate as the major flavoring. The recipe departs from the usual in only one ingredient: an eighth of a teaspoon of black pepper (freshly ground, of course). 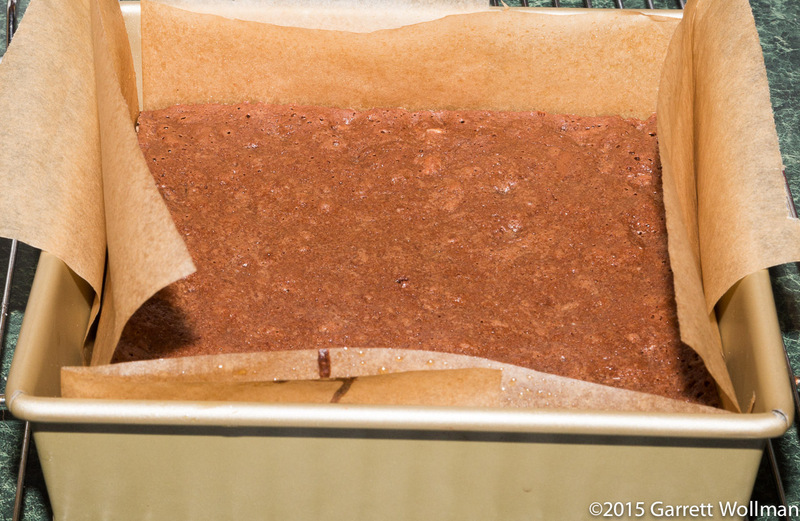 The preparation is by standard technique #2 (as set out in part 2 of this series), with no leavening, and the brownies are baked in an 8×8 pan. I used the optional walnuts, which after toasting and chopping weighed in at 55 g.
After baking, they don’t look like anything special, just your usual brownies. For Browniefest I followed the serving suggestion of 16 2×2 squares, but as you’ll see from the nutrition section below, they could easily support portioning into 9 squares instead. I was really surprised by the response to these brownies. I had thought that — despite the unusual spice — they were pretty boring, ho-hum brownies, but they came in tied for seventh place with a 3.7 “overall impression” score (n=8), received excellent marks for “moistness/mouth feel”, and despite the limited quantity of chocolate, scored well above average on “chocolate flavor” as well. One taster commented, “Maury’s Best Rocks”, and chose this recipe as their favorite. These brownies qualify as “A Low Sodium Food” under FDA regulations. 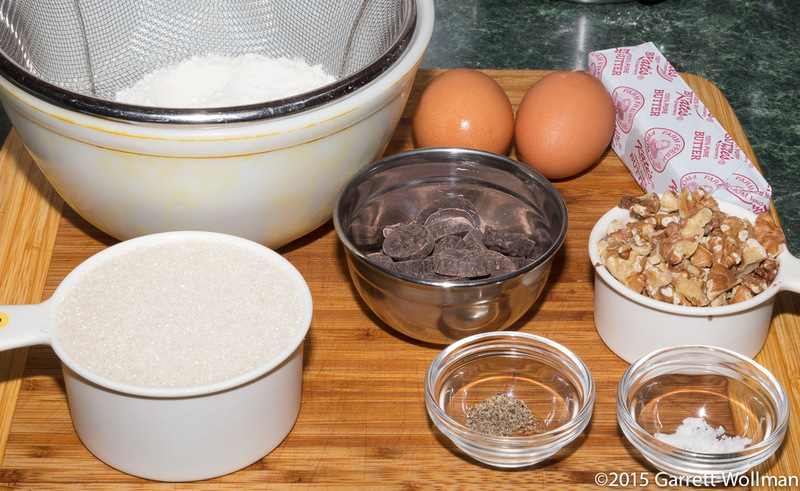 This entry was posted in Food and tagged Brooke Dojny, browniefest, brownies, chocolate, recipe. Bookmark the permalink.